I'll admit... I had a review planned for today. It's even half written. I had another one planned for Thursday that is long overdue as well. But, with it being a short week, I suspect many of us are not reading as many blog posts. Therefore, I'm holding off until next week. Knitters - Be sure to check out my review - and giveaway - of Judith Durant's new book, Increase Decrease! Dog Parents - Today is the last day to enter to win a $300 PetSmart gift card sponsored by Hill's and #InspiredByCrafted. Don't be shy or pretend like you can't use $300. 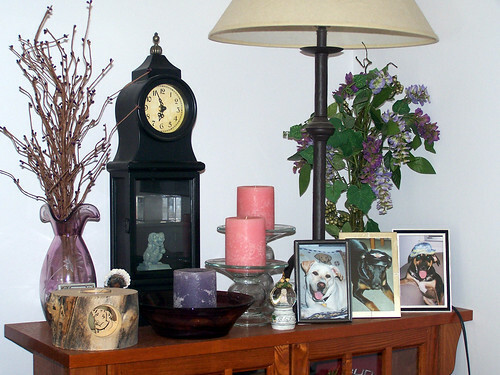 To complete today's fun, fluffy post, I'm participating in Ten on Tuesday where the topic is 10 Things I Love About My Home (which may be ironic for those who know me well, as there are quite a few things I absolutely do not love about my home and would like to change). 1. The occupants. 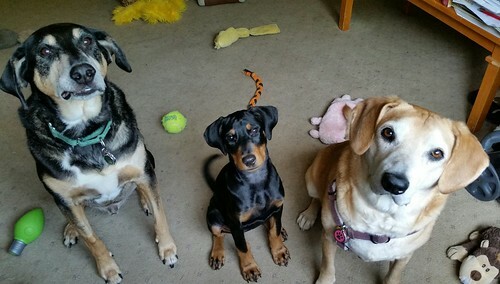 My kids and my other half. 2. It's well lived in. My home will never be one that you might mistake for a museum. There are no "do not touch" signs, but there is dog hair... everywhere! 3. The new couch covers. See above - couch covers are necessary and it's been quite awhile since I've had new, or matching ones. 4. My yarn closet. My honey did an awesome job and I absolutely love it... although I'm working on an eventual craft room. 5. The location. We are pretty centrally located to just about everything we love to do, although after being here for 14 years, I am ready to go further North. 6. Our little wild animal kingdom. 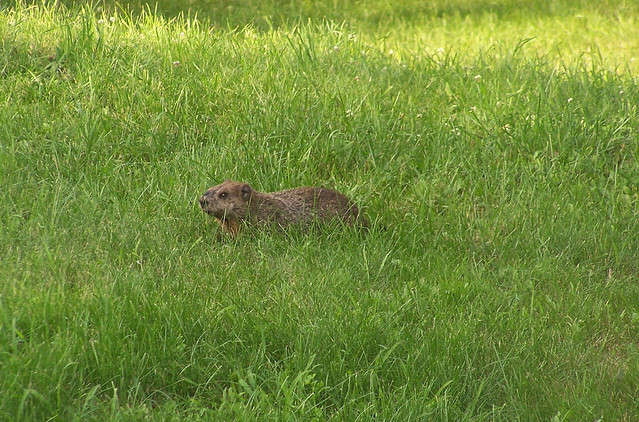 In addition to the many birds and squirrels, we have rabbits and woodchucks who make their home in our yard. 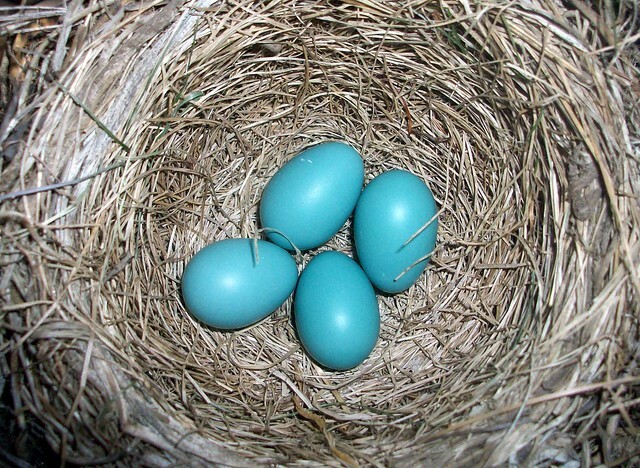 There's nothing quite like watching the babies grow every spring. We also see the occasional fox, deer, turkey, etc. 8. The back deck. I love quiet time out here. 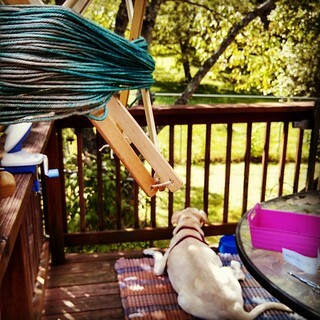 I can knit while the dogs romp and wrestle in the fresh air. 9. 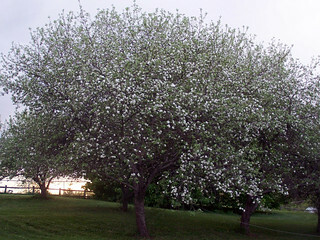 Our apple trees. Although they have seen better days, and we really need to learn to prune them. 10. The tumbleweeds. See #1 and #2 above. If you don't like it, don't visit. Your reasons 1 and 2 are why I say I'm never moving; they'll have to carry me out toes up and over the hill to the cemetery plot I've already purchased! I love your illustrations, and your little table clock is beautiful. 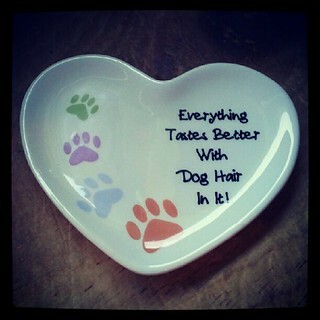 It is all about the dog hair. My home is covered with it. If you don't like dogs, you probably shouldn't be visiting me. 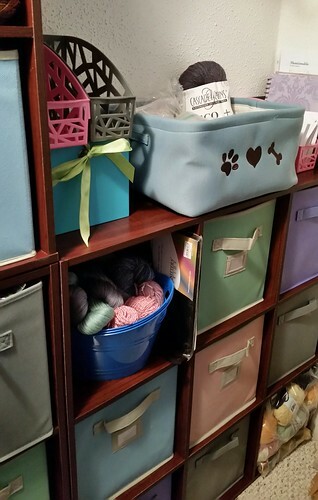 I love your yarn organization! Looks great! We have rabbits in our neighbourhood too, but they're a bit of a nuisance. My mom's backyard has overgrown to the point where she's attracted a rabbit too - in the very cosmopolitan city of Toronto - and I have to admit I fell in love with the little one when I saw it! Your apple trees are glorious! I had one for a time, but we cut it down due to disease. I miss all the fruit! Dried apples make for lovely dog treats.